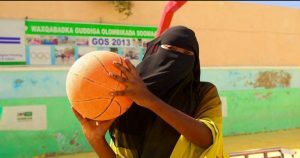 A fearless group of Somali women basketball players fight to compete in the game they love, despite death threats from militants who believe women should not take part in sports. 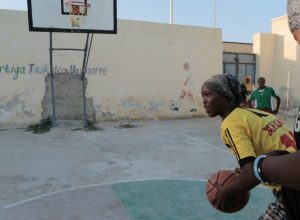 Basketball is the oldest and most popular sport among Somali women. If you would like to know more about directly supporting the Somali women’s basketball team, please click here to learn how to help! Embedded alongside the team in Mogadishu is 26 year old director, Hana Mire, following the current Somali national squad as veteran coach Nasro prepares Ilhan, Ubax and their team-mates for two crucial tournaments. Our journey begins in Mogadishu, where our characters live among the wreckage of a 25-year civil war, in a city synonymous with violence and clan rivalry. As the highest profile player in the team, captain Suwayes receives regular telephone calls from the terorrist organisation Al-Shabaab, threatening to kill her if she doesn’t stop playing basketball. We see Suwayes prepare for her wedding. Travelling to collect her self-designed outfit her phone rings. It’s Al-Shabaab. They know where the wedding party will be held — and tell her that if she does not publically declare that she will quit basketball, they will bomb the reception. The wedding is hastily cancelled. Or at least postponed for now. Ubax (Ooba) will be turning 20 in a few months. She has always been a trouble maker, known by all for her wit and bravery. Ubax is leaving home in Medina to ‘attend’ religious school. Her school bag is only a prop. She’s not been inside a classroom in months, but instead makes her way to the basketball court, inside an old warehouse, away from prying eyes. Under coach Nasro’s watchful eye she swaps her burqa for a bandana and goes through her paces with her team-mates. Our second act sees the team en route to the airport to board a flight to Garowe, a major city in north-eastern Somalia. The tournament here has been organized by NBA Africa — the NBA’s evangelical wing. This is the first regional tournament for women in decades — and the driving force behind it is Suad Galwo, herself a Somali and former member of the national team, who has been living in exile in the USA for over 20 years. Following the tournament, and the coaching sessions led by Suad, the team return to Mogadishu to prepare for the biggest tournament of their lives. We travel with them as they pit themselves against the Arab world’s top teams. Who knows how the story will end? Triumphant in Sharjah and returning to a peaceful Mogadishu under the leadership of a new president? Or defeated, disgraced and flying home to uncertainty and the continued threat of violence? Wherever the story leads us, we will follow. As a Somali woman who has lived many years in exile, I am inspired to tell this story. It is virtually impossible to film intimately in Mogadishu, achievable only by maintaining a low profile and working closely with the partners who have already enabled the production to take shape. The response to our early footage has been incredible, in Somalia, within Somali communities around the world and among international decision makers who have seen it. This time last year, I was advised that I needed a strong international team around me to help to tell this story. I believe that I have now found that team and am ready for the challenges which face me and the team in the months ahead. I began filming with this team after being inspired by their performance at the last Arab Women’s Games when they finished in fourth place. Having completed film school in Abu Dhabi it was a joy to return to my country and to find a story which shows the courage, humour and resilience which women need just to survive. I want this film to show people a side of my city which is different to that which they might see on the news, or in a film directed by someone from outside the country. It has been difficult to get to the point where we are now able to pitch, but with my new production team in place I am confident that we can make a unique and engaging feature documentary which will resonate with audiences around the world. This film will show that we Somali women are very strong. Powerful too. Trapped between war, repressive scholars and militants, we have learned to deal with every danger and injustice that comes our way, while still crying for the peace and beauty our country once knew. Somali women get our power from within, and it is transferred from one generation of women to another. Our film deals with themes of women’s empowerment, overcoming oppression, living with the constant threat of violence and terrorism, and never giving up one’s dreams. Never. Not for anyone or anything. It is about determination, will, and finding one’s own power. If doing the thing you love to do most puts your life at risk, would you continue to do it? What if it would also endanger the life of your family and friends? These are the questions that our protagonists face every single day; threatened by members of hardline militia in Mogadishu who don’t like women to play sport. 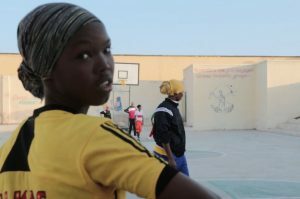 As members of the Somali National Women’s Basketball team, their profile is high, yet their defiance and resilience is even taller than the obstacles they face. We position this film beyond a simplistic discussion around the role of Islam in society. By placing the story within its historical context, particularly through coach Nasro’s story, we will encourage a progressive understanding and broaden the issue to one which will allow women to navigate the gender politics and daily struggles they face. In showing how one team of strong-willed women are struggling to achieve positive social change, we invite the audience to consider what they too can do in their own lives. Beyond the immediate struggle of the threat faced by the whole team, there are more nuanced challenges facing them. Despite Somalia’s tolerant and permissive constitution, which allows all citizens to participate in every area of society, there are deep and divisive clan rivalries. As we observe these tensions on screen, we also ask the audience to examine their own prejudices. As we travel with the team beyond their immediate environment, grappling with the impact of the daily injustice they face, which affects their lives and their sporting performance, we invite the audience to consider what steps they would take when faced with similar situations. Situations which are universal to the human condition. Most of us are unlikely to receive a phone call from a terrorist, threatening to kill us, our family and friends if we do not renounce the thing we love the most. But we can all imagine how that might feel. This film will lead us into a deeper understanding of what it takes to find the courage needed to lead the fight against violence and prejudice. We have been filming with our main characters over the past 12 months. Despite the massive challenges they face and the fact that the threats continue, they are all as determined as the film-making team to stand up to the militants and tell their stories. The film will employ two distinct visual styles (hinted at in the project teaser), combining cinema verité footage of the main characters alongside more stylised set-piece sequences of basketball action filmed by our DoP Abdurahman Hussein who shot some of the sequences for the project teaser. Rajada Dalka will be supported by an intense community and audience building process, led by Paul Rieth, an experienced PMD (Producer of Marketing & Distribution) based in Berlin with a strong affinity with both basketball and in collaborating alongside African film-makers.